CAMP PENDLETON -- Japanese soldiers and U.S. Marines recently stormed Red Beach just after dawn in assault amphibious vehicles deployed from the USS Somerset, a naval transport ship two miles offshore. Hover crafts followed, carrying ground transportation equipment from ship to shore. On land, the Marines and soldiers set up mortars, secured the beachhead and entered a nearby town in patrols. These war games -- a culmination of a four-week annual training known as Iron Fist 2019 -- was the cornerstone of the amphibious landing exercise. This was the first year the Japanese Ground Self-Defense Force used its own assault amphibious vehicles for Iron Fist. The fleet -- known as the Amphibious Rapid Deployment Brigade -- has developed from a small experimental unit into a modern amphibious force. The exercise, in its 14th year, included about 550 soldiers from the Japan Ground Self-Defense Force and about 300 U.S. Marines from Camp Pendleton. It also included two naval ships and air support. The training builds on longstanding military ties between the two countries, which have been treaty allies for nearly 70 years. It is designed to improve the ability of the U.S. Marine Corps and Japanese Force to plan, communicate and conduct combined amphibious operations. "I can't emphasis how important this training has been for both of our nations," Lt. Gen. Joseph Osterman, commanding general of 1st Marine Expeditionary Force, said during the training exercise. "Iron Fist has sharpened our amphibious capabilities to quickly deploy sea-based assets in a multinational environment. Globally, naval expeditionary forces provide an important stabilizing capability for today's unpredictable threats." 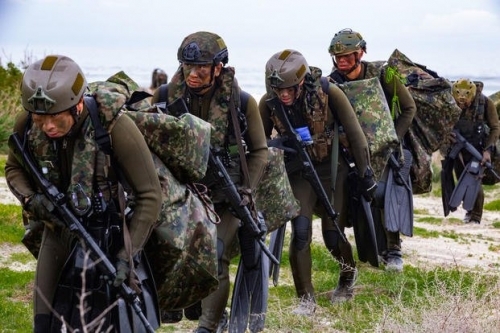 Japanese commanders say training their soldiers with the Marines has been critical in developing skills needed to prepare for challenges to Japan's security. The Japan Ground Self Defense Force was established to protect the country, uphold security and maintain peace. Japan continues to have concerns over China's increasing military strength and an ongoing conflict between the two countries over the Senkaku Islands in the East China Sea. In 2012, Japan nationalized the islands, which are near rich fishing grounds and untapped natural gas. For the Marines, the training provides an opportunity for junior Marines and soldiers to work together to develop their individual skills. Osterman was pleased with the success of the amphibious assault, in which the Japanese soldiers and the Marines ran two landing force operating centers next to each other aboard ship. "The most difficult operations you can conduct are amphibious operations," he said. "To do it in a multinational aspect with each country's own assets and doctrine, being able to fuse that all together is, frankly, an amazing thing to see, and so that objective has been reached with this exercise and really has brought it to a pinnacle in terms of our ability to work together." � Copyright 2019 Orange County Register.